Home / News / Custom Gaming Computer + Cryptomining = Money! At StealthMachines, we are always evolving to bring you the latest technology. Even though we are small, we are also nimble, which has permitted us to provide quality custom gaming computers for fifteen years. So, what does StealthMachines think is the next big thing? Well, it’s already here and it’s AWESOME! In this article, we will discuss cryptocurrency mining (Bitcoin, Zcash, Ethereum, etc.) on a custom gaming computer. 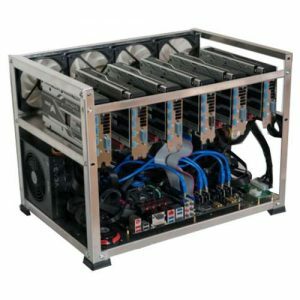 The advantage to gaming is clear: With cryptomining, you finally have the excuse to install up to SIX graphics cards on your custom gaming computer. With six graphics cards at your disposal, games run better, stronger, faster. Obviously, six cards is way better than one. In fact, it’s theoretically 4-6 times faster than an equivalent setup which contains only one graphics card. That’s because with six cards, you can enable SLI and Crossfire. SLi and Crossfire are technologies that have been with us for years, and basically how these technologies work is that they split the graphics processing power required to play game in half, or thirds, or fourths (ad naseum) depending upon the number of cards you have. As of the writing of this article, only 4-way SLi and Crossfire is supported, but we will be pushing our distributors hard to allow for the coming cryptominer revolution, and we are confident that once cryptomining becomes mainstream, the gold standard in the custom gaming computer world will be six-way SLi. So all that power is great, but doesn’t it cost six times more as well? No, unless of course you want it to. Another advantage of SLi/Crossfire setups is that lesser cards can work together to achieve better performance than their one-card counterparts. Not to mention, and this is probably my favorite part, custom gaming computers designed with cryptomining in mind can actually MAKE YOU MONEY. Yes. Since 2009 when Bitcoin came onto the scene, it has been possible to allocate your computer’s idle processing time towards the glorious endeavor of making you money. So much money, in fact, that the extra costs associated with buying a cryptominer for all your gaming needs instead of just a gaming computer are completely wiped away within a year (as of the writing of this article). So much money, in fact, that you can completely pay for your new computer and even turn a profit. Seems like a no brainer now, huh? That’s because it is a no-brainer. Esepcially since StealthMachines can build, configure, and provide support for you in your quest to make money playing computer games. Awesome. What are you waiting for? Head on over to this link (click here) to start configuring your dream cryptoming-ready custom gaming computer today!